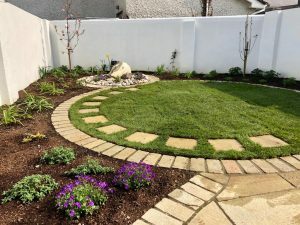 This gorgeous but amazingly simple small garden design was completed this year for a garden in west Dublin and transformed a small unattractive space into a wonderful garden to be enjoyed all year around. The garden was quite small and an unusual shape at just over 10m at its longest by nearly 6m wide. 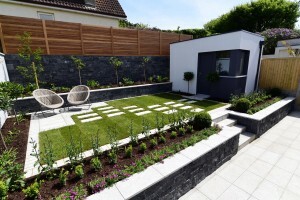 The existing garden was finished in rough earth after works on an extension to the house had been completed and the garden needed a major upgrade to compliment the new extension. 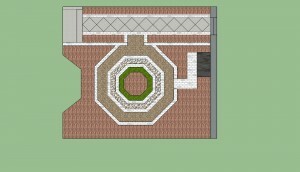 The new design is based on a circular theme with two overlapping circles interconnected to a semi-circular patio. 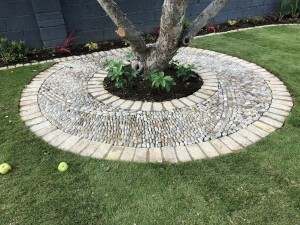 The design uses structure to create interest and also to soften the garden. 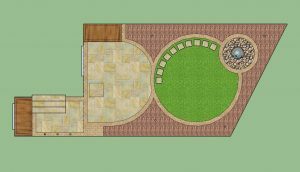 The patio is finished in tumbled yellow limestone, which adds to the softening effect and is complimented by yellow limestone cobbles which edge the lawn and patio. 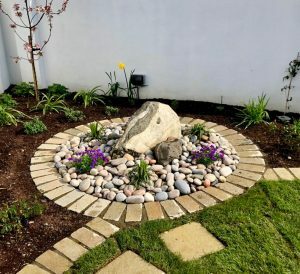 Interest is added to the small circular lawn with a stepping stone path which hugs the curve of the lawn and leads to a natural rock water feature set in a bed of Scottish cobbles near the end of the garden. The lawn and patio are surrounded by borders filled with plants which on maturity will fill the garden with colour and give the garden a feeling of enclosure. All surrounding walls were plastered and painted white to reflect as much light as possible back into this lovely garden. 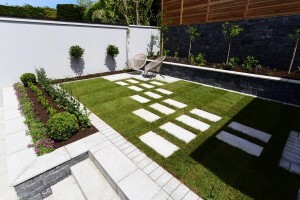 This contemporary garden design was completed this year for a garden in Dalkey, Co Dublin. 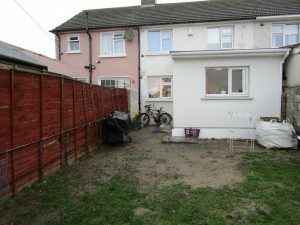 The garden was not large and already had a generous paved area, a lawn at a higher level supported by a low wall and a border at the back of the garden supported by another wall. 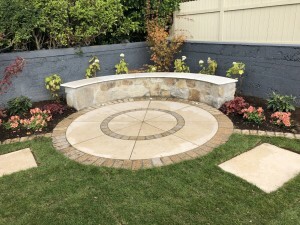 The rear boundary wall however, was the biggest problem as it was constructed from a mix of materials from concrete blocks, to natural rock and timber fencing and as it was, it would never provide a good back drop to any new garden design. In such a small garden the backdrop is very important and has to be addressed. 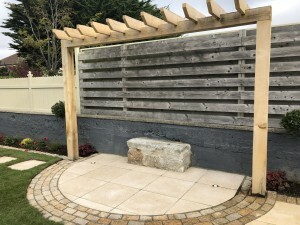 We used limestone walling to face both this rear wall and both raised walls within the garden, which due to its rich grey colour complimented beautifully the existing finish on the modern garden building located in the corner. 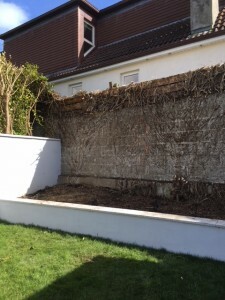 In order to completely finish the wall to the same height as the previous fencing, we then capped the wall with bangkirai wooden laths which also has wonderful depth of colour and compliments the limestone. 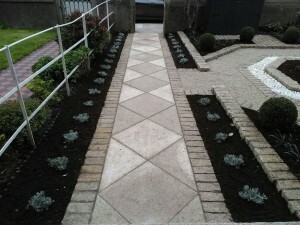 We then focused attention into the garden by creating a pattern of granite paving slabs forming a contemporary version of a stepping stone path from the top of the steps to a small new patio located in the corner of the lawn. 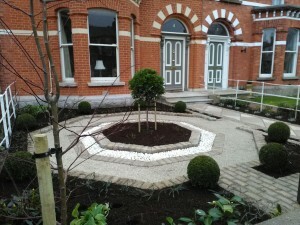 the flower beds to the sides and fore of the garden. 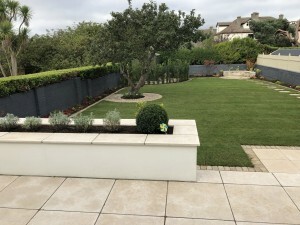 To finish the garden design, we came up with a beautiful planting scheme which enhanced the structure of the garden with more formal detail including box hedging and box balls nearest the main patio and a more relaxed mixed arrangement of planting in the border at the end of the garden.